1/3 The history of bushfires Andrew Stark talks about the history of bushfires in the ACT. A bushfire is a fire that burns in grass, bush or woodland and can threaten life, property and the environment. 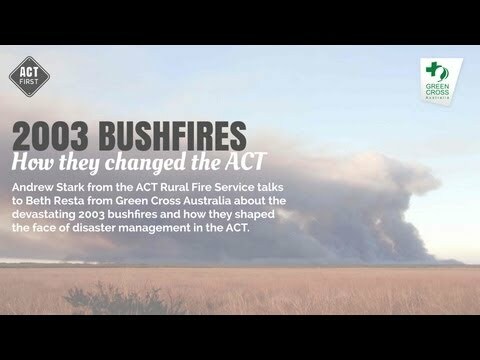 Here in the ACT, which is also nicknamed the “bush capital”, we have encouraged the “bush” to grow within our city so this means we will experience bushfire both in the farm lands, (or what we term the rural areas), as well as inside our suburbs. Where the suburbs or urban development meet the rural lands is of particular concern to fire services as it places a great number off our community at high risk from bushfire each year. 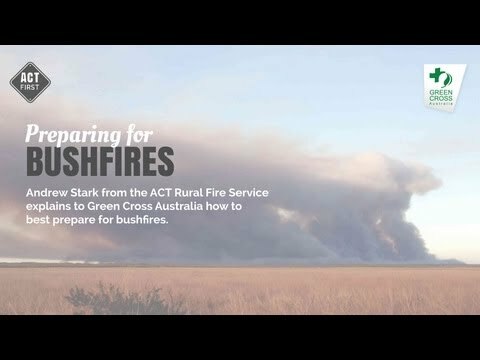 A number of factors influence bushfires. Fuel - Anything that burns is fuel for a fire, in particular leaf litter (which is the accumulation of leaves, twigs, bark and rubbish on the ground), undergrowth (shrubs, grass, seedlings), trees and other vegetation. We also include structures (such as houses, stables, sheds etc.) as fuel and any other object that will burn when exposed to flames; such as gas bottles, piles of firewood, tyres, etc. When we talk about fuels we often refer to their height. This is because fuels are found on the ground all the way up to the top of the trees, and where there are fuels fire can burn so fires can be quite small but can also reach up to 30 metres. An important term to understand is ladder fuels, which is any vegetation that grows between the ground fuel up to about 2 metres. This vegetation provides a path, or ladder, for a fire to travel up, taking the flames from the ground right up into the tree tops, essentially growing the fire from 1-2 metre flames right up to 30 metre flames. Topography / Slope - Topography is the slope of the land and it plays a major factor in bushfire behaviour. Very simply, a bushfire will move up much faster up a slope and slow down as it goes down a slope. With all factors being equal, a bushfire will actually double the rate at which it spreads for each 10 degrees that a slope increases.